A 7.45am start as Jeff picks me up for the drive over to Hope in the peak district where we met up with Paul and Debbie around 9.30am. Conditions were mild but windy as we got kitted up for the circular route around the Hope valley which we expected to be around 8 miles in distance. The first section was low level across fields as we made our way over to the neighboring town of Castleton. From there we began our ascent up the side of the valley up the narrow and rocky “limestone way” up past Peveril castle. Progress was noticeably slower on this steep, wet and tricky section as the ground was difficult to get stable footings on. After what felt like forever the limestone walls opened out and we made our way back onto open ground across higher fields dotted with sheep and lambs. 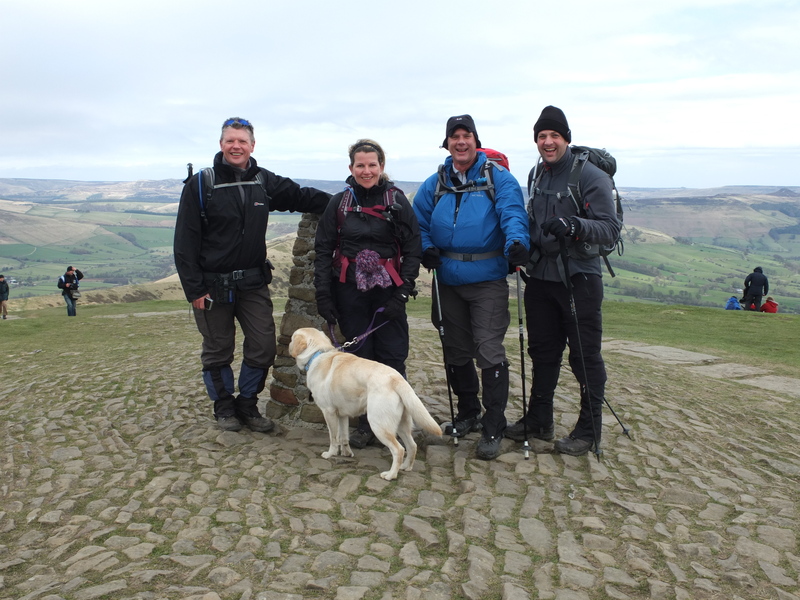 A few more miles in brought us out over a high fell road and to the base of Mam Tor where we paused for lunch. Looking up at the route to the summit we were envisaging burning calves and puce faces however as we got closer we found that whilst is was certainly steep in places the inclined felt more manageable due perhaps in part to the stone path work that had been laid. The views from the blustery top were magnificent as we gazed back down into Hope valley on one side and over the Edale valley to the other. After a quick photo stop around the summit trig point we were off along the hills ridge line for the next few miles as we descended and then rose again over multiple smaller peaks. In this manner we worked along the northern side of Hope valley until we made our final descent back to our starting point in Hope village. From today’s hike I think everyone’s fitness is coming on nicely and we all seem to be handling ourselves and equipment with aplomb. With just over 6 weeks before we leave for Kilimanjaro we only have a four more weekends where we’re all free to train together. I’ve posted the climb stats (which seem shorter than 10 miles Paul’s phone recorded using the same app) and uploaded photo to the Kilimattjaro facebook page. Love the post! Sounds like you’re getting in tons of training! Good for you. Also, love the Yellow Labrador in the pic. I have one and he likes to train with me. Wish I could take him with me to Kilimanjaro! Yesterdays walk was really nice – stunning panoramas across two valleys as we walked along the northern ridge line. I’m trying to get out every weekend and then supplement some shorter walks during the week and/or get in the gym. I like to view the training as making deposits in the bank that I can withdraw when I’m on Killi.